Recommended and worn by top riders, the Hit-Air Inflatable Air Vest will instantly inflate in the event of a fall. The vest deploys in 0.25 seconds to cushion key areas and decrease your chances of serious injury. 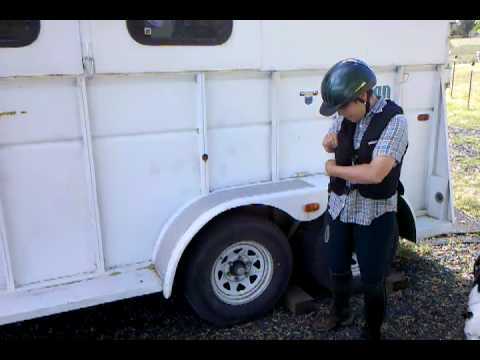 The jacket with the HIT AIR (Shock-buffering Protection System) is to be worn as outerwear when horseback riding. The award-winning air bag is triggered when the rider and horse become separated to provide a stabilising, shock buffering system for added protection to the neck, spine, chest, ribcage, lower back and vital organs. It is important to make sure your Hit-Air vest is correctly fitted and adjusted before use. It is compulsory to wear a body protector at FEI and BE competitions, so please take this into account when measuring yourself for an airvest. When fitted correctly, the vest should be a close enough fit so that it doesn't buffer in the wind, but at the same time, it needs to be able to freely inflate. It is imperative that your airvest is not worn underneath other clothing / protective equipment, as it needs to be able to inflate freely and without hinderance. The following size chart takes into account the Hit Air Vest, ladies size, chest size and waist size (in inches). Please note, the waist fastening is highly adjustable. The chest area of the vests is also very accomodating across various sizes, due to there being no 360° restriction enitrely around the chest. The survey suggests that the outward inflation is still an important factor in choosing Hit-air. We have a patent on the design to fold the airbags away within a harness style vest. This allows the vest to inflate outwards, which has several major benefits. There is no possibility of winding the rider on inflation, although the vest still provides a stabilising affect to the upper torso. This is very important to our riders. This also makes them safe for riders with pre-existing chest conditions. This also means that the vest can be worn neatly over the body or body protector as the vest does not need to accommodate the inward inflation. 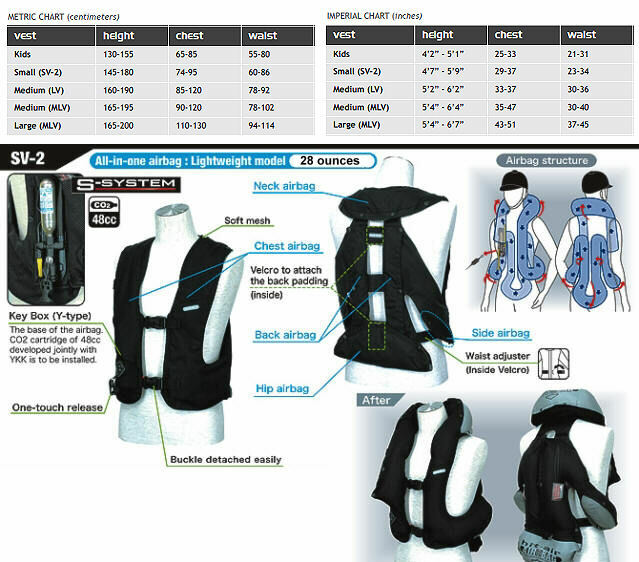 So the vest is discrete and it limits the interference with riding.The outward inflation, combined with adjustable internal straps also means that the vest can be layered neatly over a t-shirt in the summer but can accommodate coats and fleeces in the winter without risk of being too tight on inflation.In this particular survey most riders who purchased an air vest (54%) were planning to take part in the more extreme equestrian discipline, eventing although many of those were also planning to use the vest for excerising horses at home,Leisure riders (21%) are increasingly choosing Hit-air as a means to increase protection in every day riding. This figure has been even higher in previous customer surveys. "Asked for one as a birthday present as fallen off a few times recently. Very comfortable - don't notice I have it on. Very bright (at the moment!)"